Going beyond failure doesn't have to put your spine at risk. Discover cheat-centric reps and add a valuable new muscle-building tool to your arsenal! I&apos;m a stickler for strict form in nearly all situations. It doesn&apos;t matter to me how much weight you&apos;re putting up; in fact, I often advise people that using less weight is better for them. Why? The increased control that comes with using a slightly lower weight can help you maximize time under tension, which is the real determinant of muscle growth. However, I&apos;ll grant that there&apos;s a time and a place for cheating. That time is after you have the fundamentals down and have been training consistently for a while—no beginners here. The Dalai Lama and many other smart people have offered up variations on the quote, "Know the rules well, so you can break them effectively." I&apos;ll just add: Follow the rules before you cheat, or you&apos;ll only cheat yourself. Are you sure you&apos;ve earned this privilege? No really, are you? If so, then you&apos;re ready to meet cheat-centrics. "Follow the rules before you cheat; otherwise, you only cheat yourself." Put simply, cheat-centrics are reps which involve cheating the weight up by using other muscles than what you&apos;re currently targeting—the legs for a biceps curl, for example—followed by a slow eccentric or negative portion lowering of the weight. The reason this works is because when your muscles are too fatigued to lift the weight themselves, they still have the ability to lower the weight. Simply put, you&apos;re stronger eccentrically than concentrically. Researchers have known this for decades, but only more recently have they been pinpointing how best to take advantage of it. Research also found that eccentric contractions are less metabolically taxing, because they use less ATP (the currency of cellular energy) than concentric actions. "Muscles contracting eccentrically produce &apos;more for less,&apos;" concluded Lindstedt, Lastayo, and Reich in 2001.3 This makes eccentric training perfect for when you have less energy to give at the end of a workout. "Like most other overload training tactics, cheat-centrics fit well with certain exercises and not others." Like most other overload training tactics, cheat-centrics fit well with certain exercises and not others. Below are my four favorite exercises to use them with. The descriptions are not about how to do normal reps, because you already damn well know how to do these moves. These tips should just help you bang out a few more reps and reap the benefits of eccentric training. Instead of performing a strict press, perform a push press, which uses the legs to help the upper body drive the weight overhead. Once the weight is overhead, slowly lower the weight using a 4-6-second eccentric. If you can no longer get your chin above the bar while keeping your body stiff, you&apos;re allowed—only in this circumstance—to kick your legs in order to cheat your way above the bar. Once there, slowly lower yourself down, taking 5-8 seconds to reach the bottom. If you have no more strict reps left in the tank and want to get a few extra reps to finish the set, cheat the dumbbells up in basically the same way as for the standing overhead press. Bend your knees a bit and use your legs to cheat the dumbbells up, and then emphasize the eccentric portion by taking 4-6 seconds to lower the dumbbells back down to your hips. 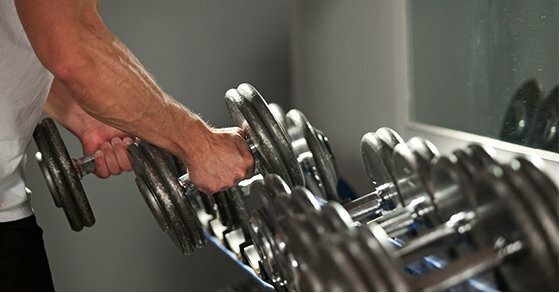 Yes, you&apos;re allowed to cheat on biceps curls, but not the way you&apos;ve probably been doing it. I absolutely don&apos;t allow extending at the lower back in order to cheat your last few reps up. Instead, utilize a little hip extension and leg drive while keeping the spine in a neutral position in order to get the weight up without potentially harming your spine. From here, use the same strategy as for the shoulder movements, no matter if you use dumbbells, the straight bar, or an EZ- bar. Slowly lower the weight taking 4-6 seconds on the eccentric portion. The exercises listed above are obviously all upper-body exercises that easily allow you to use your legs to help you lift the weight up. For exercises like the bench press and barbell squat, you&apos;ll have to be more creative and careful. To perform what I call a partner-centric, have a training partner help you lift the weight up. This will allow you to perform a few slow eccentrics—without help, of course—to finish your set. Take care with these: Make sure you have a good spotter, and definitely don&apos;t expect the reps to be easy simply because you&apos;re not performing the concentric portion. As with any other overload training technique, cheat-centrics aren&apos;t something you should do at the end of every set of every exercise. Just sprinkle then into a few sets during your workouts. Don&apos;t let cheating become a way of life for you in the gym. It&apos;s easy to begin using your back to cheat rather than your legs—that&apos;s why you&apos;ll see it happening in every weight room, every day. Train smart and let the other dudes be the ones who end up buying the local back surgeon a new Porsche. Proske, U., & Allen, T.J. 2005. Damage to skeletal muscle from eccentric exercise. Exercise & Sports Sciences Reviews, 33 (2), 98-104. Doan, B.K., et al. 2002. Effects of increased eccentric loading on bench press 1RM. The Journal of Strength and Conditioning Research, 16 (1), 9-13. Lindstedt, S.L., LaStayo, P.C., & Reich, T.E. 2001. When active muscles lengthen: Properties and consequences of eccentric contractions. News in Physiological Sciences, 16, 256-61.